Mark Ogle was one of the earliest members of Shore Poets and one of the first to read at the group’s original venue, the Shore Gallery in Leith. A poet of great depth and sensitivity, his reading so impressed the founders that they invited him to become the third Shore Poet. He brought a stability, enthusiasm and commitment that helped catalyse and perpetuate the group after the Gallery closed and new venues needed to be sought. Always closely involved in the running of the group, Mark played a considerable part in organising the appearances of Norman MacCaig and Edwin Morgan at the 369 Gallery. Mark continued this level of involvement even once the group had been expanded, and gave many memorable readings. A year after Mark’s death, Stewart Conn and Hugh Dailly edited his posthumous collection A Memory of Fields (Akros, 2000). You can read more about Mark here. Mark’s untimely death left his considerable poetic talent under-realized. 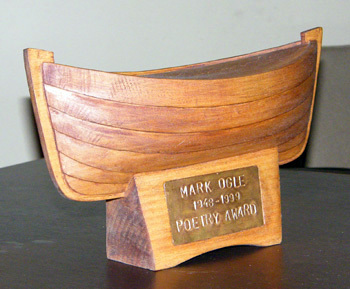 Mark’s family decided to commission an annual award in which a poet responds to one of Mark’s poems. The poet is selected from all poets who appeared at Shore Poets in the previous season.